I would like to give a shout out to Greg Sellers of Motor Tabs. I met a Motor Tabs rider named Mark on Jamboree. We chatted for a bit and then we climbed at our own pace. Thanks for the support Motor Tabs! I missed the train in Oceanside yesterday which threw a wrench in my recovery ride plans. I did a 600km (373 mile 18,000 feet of climbing) brevet on Saturday see below. So I did a little discovering instead. 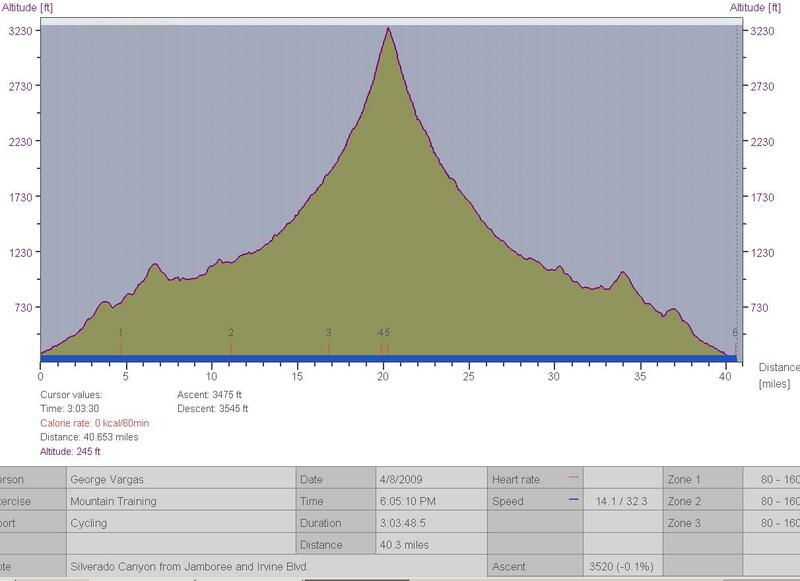 I had read a thread on Bikeforums.net that discussed sustained climbs in Orange County. I’m fairly new to Orange County and was interested what people considered “sustained”. One poster mentioned Silverado Canyon. I only knew of it as a 5.5 mile rolling stair step climb. But he mentioned that you could ride past a gate and continue another 3 miles on pavement. After the 3 miles of pavement it gives way to a hard packed dirt road. The climb past the gate is steep and as you can see from the graph it gets progressively steeper. I rode a 53/39 and a 11/27 (homemade) and spent a lot of time 39×27 seated and 39×24 standing. Based on my effort level and gearing I’d say it’s at least 8% grade. The climb is deceptive because the surrounding canyon goes up with you. But beware the water crossings. I fell on the first one (about 5 crossings). I was going less than 5 mph and I still fell. Putting my carbon soled shoe out to stop my fall was useless – know what I mean? The paved road isn’t great, it has lots of ripples, but it’s paved nonetheless. Now for the adventure part–since this is GEORGE’S EPIC ADVENTURES. I didn’t have lights!! I made my turn around at 7:45pm. It became prematurely dark because of the rain clouds hovering over the canyon. I thought I was alone it was dark and it was getting colder at over 3,000 ft elevation. I’m on the dirt section only .3 of a mile and I’m looking for a satisfying “summit” but the road just kept climbing. Just then I see headlights. I flag the motorist down and his first words are “Damn you got more balls than I got!” He was a young guy too– mid 20’s. Aren’t they supposed to be fearless? I’ll just consider it my naivety. But I digress, I asked him how much further the road goes and he says “How far do you want to go? Hwy 15? Temecula?” I then decided it was time to turn around and follow the little bit of light I could get from the pick-up truck being in front of me. I eventually lost the truck as I had to dismount at the stream crossings. After losing the pick-up my speed slowed way down because I couldn’t see a thing. I was really cold on the descent. I had a Hi-Vis shell but my hands and my feet, which were wet from the crossings, were really cold. My greatest fear was getting attacked by a mountain lion. I don’t know anything about their hunting habits and I felt defenseless. Knowledge is power they say and I felt powerless. I will be doing some research before going “out there” again. I want to continue up the dirt road and see where it goes. I think there is an opportunity for Rough Riding up there! I made it back to the car sometime after 9pm. Thanks for reading. Show some love, comment if you feel compelled. This entry was posted in climbing, Mountains, rough riding by REV Cycling Directeur Sportif. Bookmark the permalink.